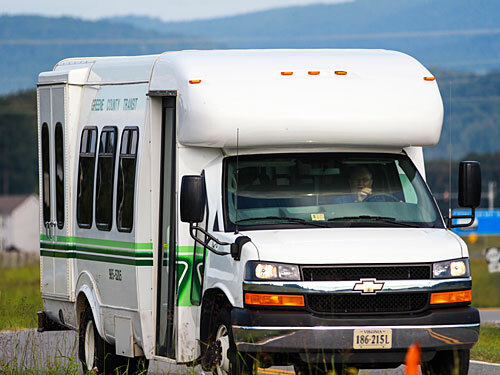 The Greene County Transit, Inc. is an incorporated transportation system, funded by the Virginia Department of Rail and Public Transportation, operating under the umbrella of the governing body of Greene County Virginia. Our transportation services have been in operation since 1976. Operating as a demand-response transportation system, door to door service, we provide transportation for the elderly, workers, shoppers, handicapped, or anyone in our county that may have a need for transportation service. Destinations such as doctor visits, pharmacy needs, shopping, work related, library, sports events, Senior Center, or whatever the transportation needs might be for the citizens of Greene County, are fulfilled by the Greene County Transit, Inc. promptly, safely, and more economically than any other source available. Scheduled trips with GCT are based on a telephone call-in type of system. Although the number of citizens in Greene County has increased so rapidly in recent years, Greene County Transit has managed to meet all transportation needs, and will continue to plan accordingly to meet the transportation needs of the future. Staff members of Greene County Transit, Inc. are regularly trained in public relations, safety, efficiency, and many other areas of interest pertaining to public service that may make our clients have the best of services available. Our transit office is located in the Stanardsville Shopping Center, and any request for information pertaining to your transportation needs may be answered by calling 434-985-5205 during our regular working hours of operation.